The Avon Early Childhood PTA is thriving and so are our families! The purpose of an Early Childhood PTA is to help parents of Preschool-age children better understand their children via qualified resources, education programs, the sharing of experiences, and social activities. Our mission “Community, Family, Friends” helps our volunteer run organization to focus on who, where and why we give our time and talents. So we’re inviting you today to invest in our families in an exciting new way. 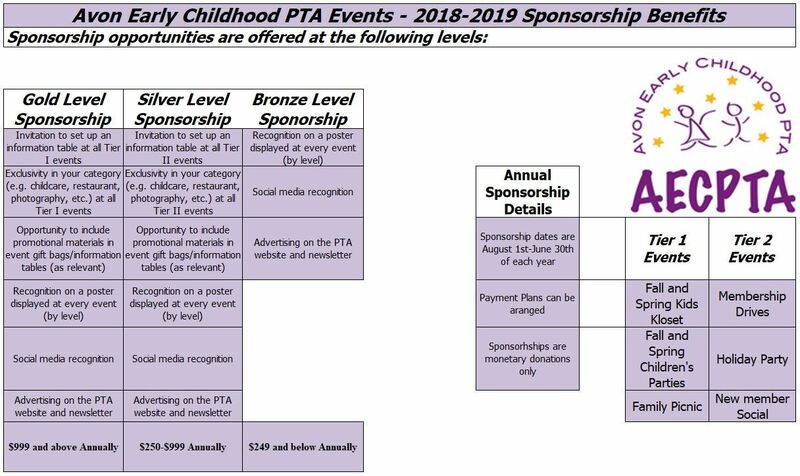 Please join the Avon Early Childhood PTA by working with us to promote our unique and wonderful family friendly events. Your support of these events will provide children and their families the opportunity to come together as a community in a safe and fun environment. Your tax-exempt sponsorship is an investment that assures the continuation of a “Community, Family, Friends” in Avon. In addition to giving to a great cause you will also receive the benefit of getting your businesses name in front those in our community that have the greatest buying power, Moms. The Harvard Business Journal reports that women drive the world economy and control about $20 trillion in annual consumer spending. Additionally, we have approximately 200 active members that receive constant event announcements via email, newsletters, web and social media. If you are ready to have your company sponsor one of the events below, please utilize the following form: Sponsorship Commitment Form 18-19.doc. If you have any questions about our Sponsorship program, please email vp@avonecpta.org or president@avonecpta.org. welcome all families with children from birth through kindergarten in Avon and the surrounding communities.